Ruighe-aiteachain is currently undergoing a major renovation and will be unavailable to the public until work is completed. More details will be posted as they become available. Ruighe-aiteachain (pron. Roo-ee Etchachan, second ‘ch’ as in loch). 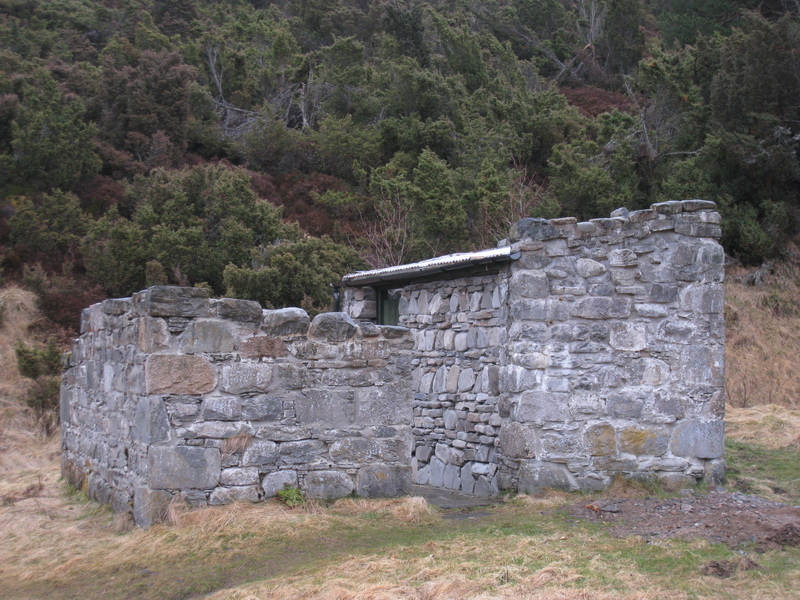 Often referred to as The Feshie Bothy. Located up Glen Feshie at grid ref NN 847 927. It’s snuggled close in to the foot of the hill, to the east of the river as you follow it upstream southwards, not far before it starts to turn to the east. The closest approach is to park your car at a car park at grid ref 853 977, about a kilometre before Achlean Farm. Walk along the road to where it ends at the farm and pick up the footpath which leads (across two normally straightforward stream crossings) to the bothy in about 5 to 6 kilometres. It used to be possible to approach the bothy along the west of the river – a longer approach but one where it was possible to use a bike. However the bridge at Carnachuin (846 938) was destroyed in a flood in 2009 and fording the river is only advisable when the water is low. It is understood the estate intends to replace this bridge. This approach follows the start of the classic drove road through Glen Feshie to the Linn of Dee. 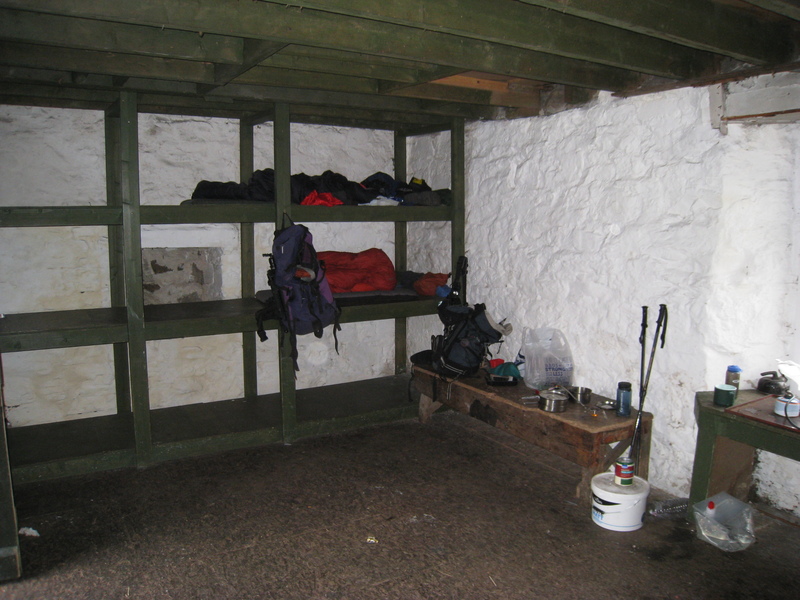 The bothy itself has two rooms: the first, as you enter, containing sleeping bunks and lots of floor. Enter the second room through a rather elaborate door to find a more comfortable room with tables, benches and a good stove, which is said to be a lot more effective at heating the room than the previous version. There are only about half a dozen bunks, but this is a spacious bothy and there should be no problem in sleeping many more people between the two rooms. The estate does not want people picking dead or live wood from the area around the bothy, but generally sees that a plentiful supply of wood is stacked against the north wall of the bothy. This can sometimes be a bit wet for good burning and it is well to take a small quantity of coal to ensure a reasonable heat. A 10kg bag between two is not unreasonable to carry. There is a good water supply a few yards from the bothy, with a cistern and pipe ensuring easy collection from a small stream coming off the hillside. There is an outside toilet in a separate building a few yards south of the bothy. This is a septic tank and is flushed with buckets of water from the nearby burn. Put only human waste and plain toilet paper down this. Wet wipes and other products do not break down in the tank and can cause blockages. 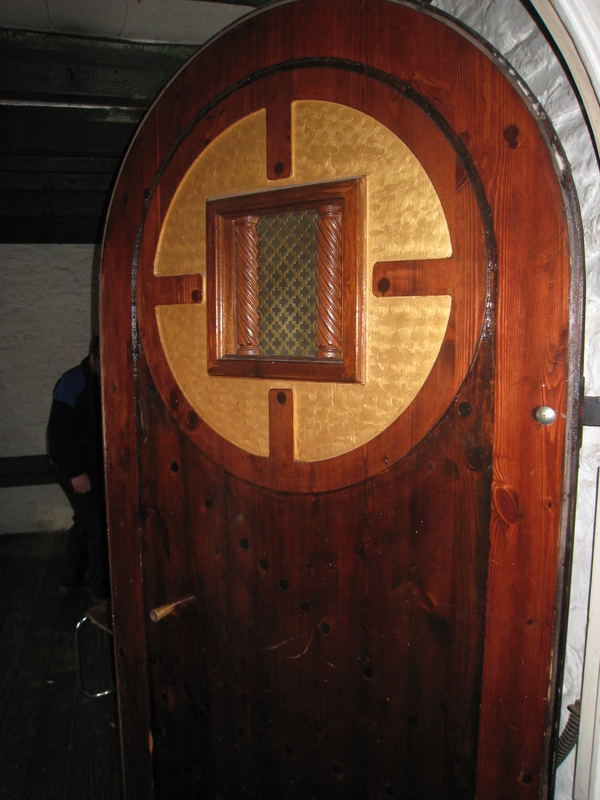 Oh, and here’s a photo of the ‘elaborate’ door referred to above. Typical bothy architecture really. Rather beautiful door – if a little Hobbity! I remember one of the many times I stopped here overnight. A boy was sleeping upstairs on the floor. In the middle of the night, he turned over in his sleep and fell through the access hole (still in his sleeping bag!) straight down onto the floor next to me.I don’t know who got the bigger shock…. Maybe just as well they closed off the upstairs section! 🙂 Not sure of the timescale, but I understand the estate is planning a renovation of Ruighe-aiteachain. Will post as and when I know more. Just as well the bothy MO was there too when this happened. He borrowed my bike (bust the wheel on the way) and cycled out to get vehicle access for the poor wee lad who had concussion. When would be teh quietest time to visit, what you recommend? Hi Steve, I’ve long ago given up trying to forecast when a bothy will be busy or quiet. Summer and holiday weekends are probably the busiest, but it only takes a few people to pick on any weekend and you can end up being busy. Likewise you can be rattling about on your own even in a great weather weekend. I kind of like it when you meet other people in a bothy anyway – as long as it’s not too stowed out. If you want best chance of it being quiet then probably aim for a midweek visit. Failing that, try a weekend when there’s a massive football match on. Thanks for replying, I am with you. I do like meeting others there. But I had a bit of a nightmare at Ryvoan Bothy. Two friends myself turned up there in a November weekend, two dogs included. About 4pm we thought we had the place to our self. Then two nice lads from the central belt turned up. Happy days, nice lads we thought, should be a nice night ahead. Next things 8 students from Edinburgh come in the door. It was November so the floor was like a mill pond. So we had to head home, with the dogs and the state of the floor and no tents. It would just be too much to stay. We only live an hour drive away so wasn’t too bad. Anyway thanks for your reply, will let you know when we go and if we meet any characters. Ach, it can be a pain when students turn up mob handed – they’re really bad for that. Just tell them they’re not meant to come in bigger groups than six, make sure you have your bags in the best bed spaces, and take an authoritative attitude. Sometimes they’ll revert to school mode and do what they’re tell’t – at least enough to let you keep your corner. Ryvoan used to be bad with lots of folk in because the floor always got wet – just about planted a guy once for wringing his gloves out on the floor – but there’s a large sleeping platform there now which helps. The Feshie bothy has bunks in the cool room and in any case has a bit more room, so might be better. Hope you enjoy your stay anyway. Has the Carnachuin bridge been rebuilt yet? My daughter and her partner are visiting the Cairngorms in Oct. and I’m thinking of recommending that they try the bothy for a night, approaching from Achlean. In the past I’ve approached via the tarmac track and I would advise them to do the same, rather from the other bank, which is an unknown for me upstream from Fors Feanaghan(sp?). Hi Jim, I don’t think the bridge has been repaired – but nor do I know what damage has been done (or repaired since) to the path on the east bank in the last floods. 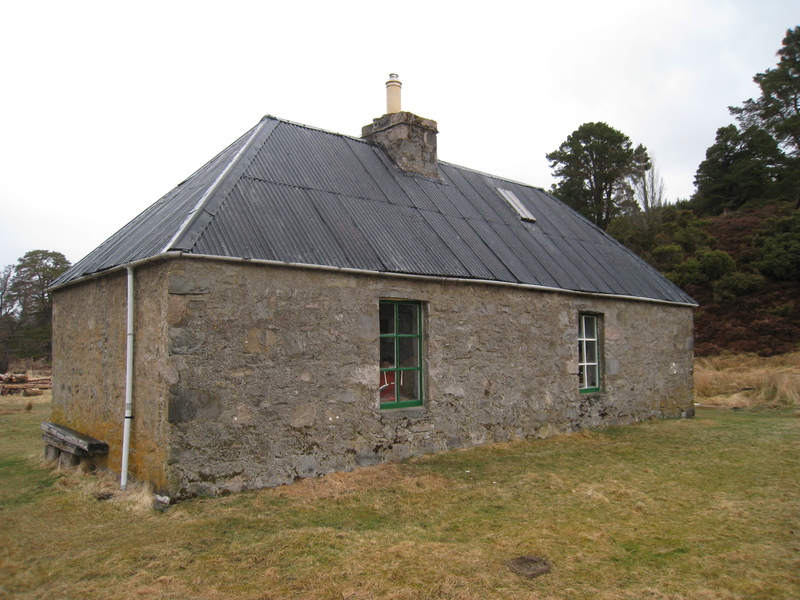 In any case, you might be advised to check with the MBA and or Feshie Estate, as the plans to renovate the bothy are supposed to be being put into action very soon. I have tried emailing the estate myself, but got no answer. Do you know if Ruighe-aiteachain is open again or if there is a date for the renovations to be completed? Also what is the current state of Garbh Choire? Many thanks. Wish I knew… about either! I have tried emailing the Feshie Estate, but don’t get replies. Last I heard, by way of hearsay, was that it would be sometime in the spring, but can’t repeat that with any certainty. As for the Garbh Choire, it’s much as it was – sadly deteriorating. Last time I spoke to the estate about it they were adamant they would be holding a consultation, but still don’t have a date. Hi Neil! What is Ruigh Aiteachain like these days in Upper Glen Feshie? Is the refurbishment completed? Looking for a spot of shelter and a place to have lunch with a group. Thank you, Stef. Hi Stef. I’m afraid it’s still out of action, although from the last photos I saw it can’t be far away. Don’t know just how high-end a job has been done, but I can’t help thinking that the MBA could have done it a hell of a lot quicker and maybe not as fancy but certainly robustly. Hi Neil, thanks for the reply. I ended up going last week and they are doing a nice job there. New windows, patio, extra sleeping platforms etc. It might be a while until it’s finished but will be exciting to see the end result ! I think everyone’s looking forward to seeing the end result. Hope you had a good time. Stef was the bothy open but still getting worked on or closed completely? Hi Neil, Just wondered if you had heard any updates if Ruighe-aiteachain is open yet? We are up on our annual walking trip this weekend and our original plan may have been thwarted by Carnoch Bridge over in the Knoydart being removed so I am looking at alternatives. We walked from Aviemore to Blair Atholl this time last year and bumped into you in Corrour a slightly warmer night there (thanks to your bag of coal) than the following night in Tarf Hotel! Hi Matthew, Officially Ruighe Aiteachain isn’t open yet, but people have been using it for a couple of months now, apparently with the knowledge of the landowner. 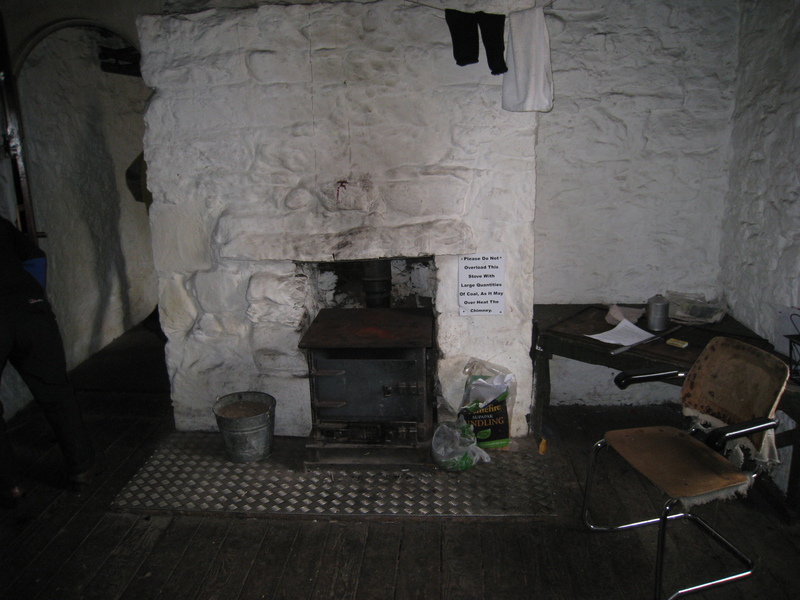 As far as I can gather the problem is with red tape and paperwork, but the work to the bothy is complete and by all accounts very plush. Hope you have a good time wherever you end up. Yeah, I really need to get out there and update the blog.